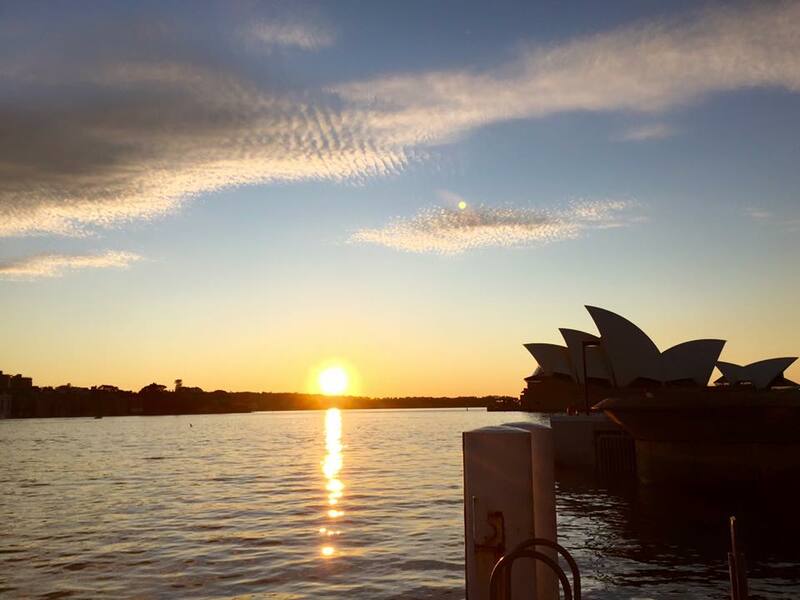 We have just had a wonderful weekend in Sydney at the Boat Show. It is the largest boat show in the Southern Hemisphere, and I must say I was impressed! There was a huge number of boats on display on the water and a large convention centre full of fizz boats and other accessories. We were a little disappointed with the lack of certain suppliers – such as solar panels, wind generators, diesel heating and that kind of thing. We would have also liked to see more of the small innovative products that you often see advertised in the back of cruising magazines. I guess the price of renting a stall at these shows makes it cost prohibitive for some small suppliers. The good news is that we managed to have a really good look at all the yachts on display in the size range we are looking for (38-40′ ish). There were lots of lovely larger boats on display as well, but we deliberately resisted the temptation to go onboard. The idea was to narrow down what we want, not extend the list! All the boats we looked at were very similar in their design – sloop rig, twin wheels, aft swim platform, two cabins & a lazarette storage area. 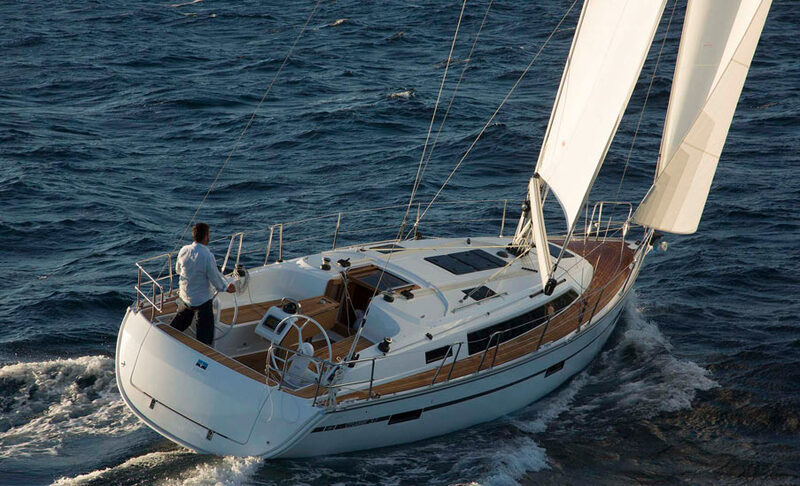 First off was the Jeanneau Sun Odyssey 379. We saw this boat in Auckland last year, and we were really impressed. We have since found a blog called Sailing Mareda. 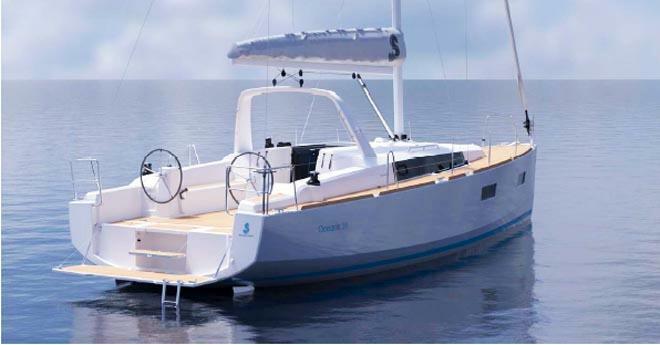 Maria & Patrick have just bought a brand new Sun Odyssey 379 and so we have followed their progress closely. Also Pink Diamond is a larger Sun Odyssey based in Tauranga, also bought from new and they too have given us some great advice. Both of these couples were really pleased with their boats so far too which is always encouraging. We crawled over every nook and cranny of the boat, and still loved it. The idea being that we used it as a base line to compare the other boats to. 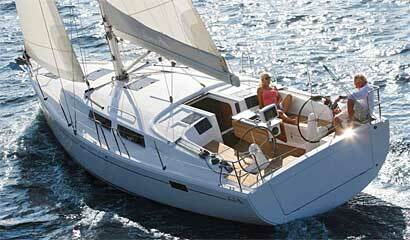 Next was the Bavaria 37 Cruiser. This was a boat that we first saw at the Barcelona Boat Show and was what really planted the seed in our minds that we might be able to afford to buy a new boat. There were a few things we didn’t like as much as the Sun Odyssey. There was only space for 1 gas bottle, the deck felt quite slippery under foot (could have been because it was brand new perhaps?) The rigging lines on the coachroof were all exposed, not as many hand holds down below, and the boarding ladder wasn’t integrated in to the swim platform and the seating below couldn’t convert in to a bed. 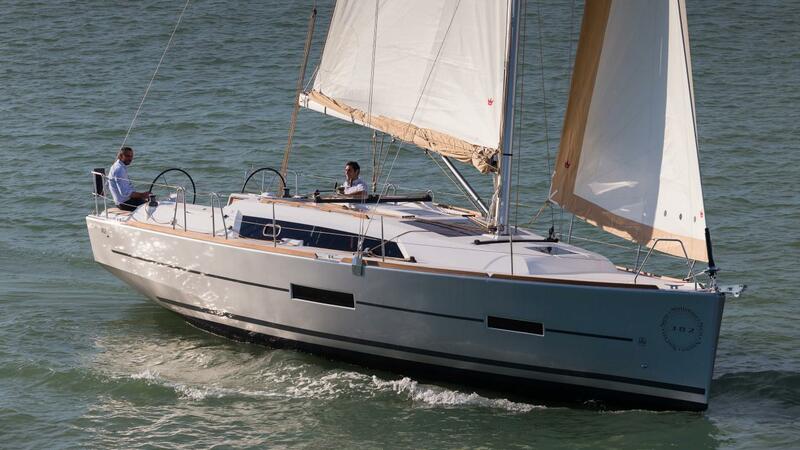 Next up was the Beneteau Oceanis 38′. I didn’t think I was going to like this boat as it had a funny looking spoiler-type attachment – a solid white arch going up above the companion way. This is in fact the main sheet traveller, and when the dodger is up it didn’t actually look too bad. Having the traveller there means they have been able to move the companionway forward, really opening up the cockpit area. The mast has come back too. The deck was fabulous and the boat felt much larger than the other yachts in the same size range. However down below we didn’t like it so much. The only option for the galley was along one side – no L shape available. There were very few hand holds and the lovely big windows looked amazing, but I had concerns about how structurally sound they would be if you were bashing in to a heavy sea for days on end. Anyway it was a lovely boat, but not the one for us. Andrew liked the Hanse 385 better than I did. We went back for a second look the next day and our reasons for crossing this one off the list were that there is only 2 winches on the boat, both back by the helm, which I am sure would be really handy if you are sailing short handed. However the jammers and lines are all up on the cockpit coaming which means you can’t sit up there, and I, no doubt, would trip over them every time I stepped out of the cockpit. The washboards slid down, but the catch still rose above the actual lip on the companionway, catching toes and trousers on the way through – this would be a great storage space for crumbs and fluff too – just not well designed. The anchor well was really small compared to the other yachts and again the deck felt really slippery like the Bavaria. There was only space for 1 gas bottle. The ladder wasn’t incorporated in to the swim platform either. 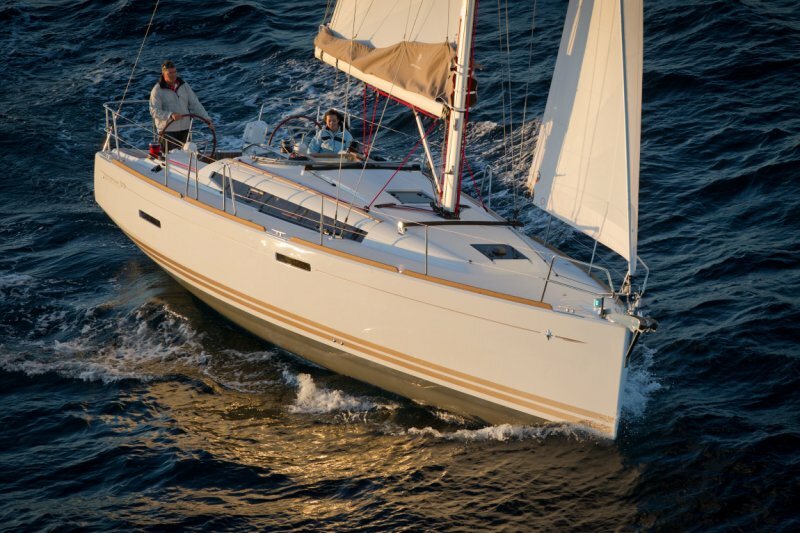 The Dehler 38 is more of a racer than a cruiser. 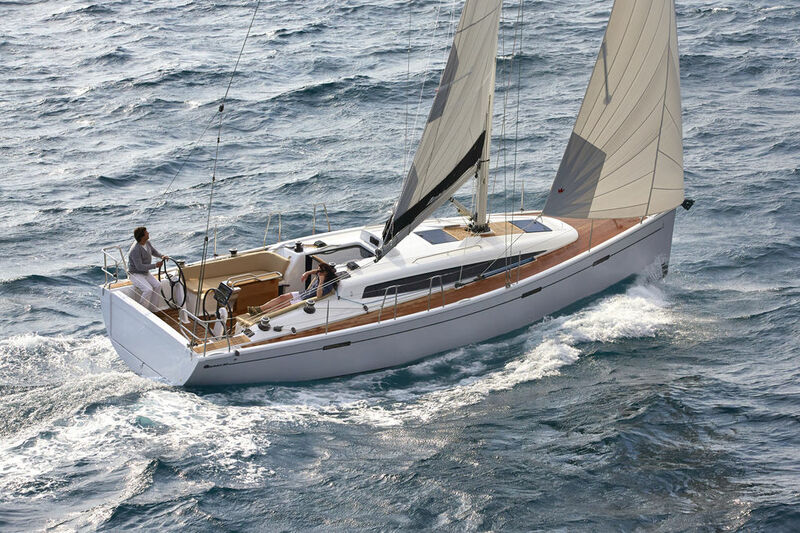 Also part of the Hanse family, there were some really cool design features on this boat, but it isn’t designed for full time cruising and the mainsheet traveller was in the cockpit – one of the things we really wanted to avoid. Finally we also really liked the Dufour 382. This one also made our list to come back for another look on the Sunday. While the name might suggest it was around 38′, the actual waterline is just 32′. It felt smaller, and we didn’t like the glass top located at the base of the mast. We thought that as well as being potentially really slippery at the worst time – i.e. when you are wanting to put in a reef for example, but it would also be a nightmare to keep clean and try not to scratch. The lines come over the deck – not below, and there looked to be a big gap where water could come in under the dodger. There wasn’t a dodger installed. The two huge cockpit lockers that could be accessed via the floor would be great for storing dive tanks etc, but they were open when the swim platform was down. I could easily imagine things being lost or pinched from these lockers. This was also a brand new model with the long bench kitchen, so we couldn’t see it with the set up we wanted. So we went back to the Jeanneau Sun Odyssey and again confirmed that this boat has all the features that are really important to us. Things that are very cool that set it apart from the others is a little step on the back of the transom, so if you are approaching in a dinghy when the swim platform is lifted up, there is still somewhere to stand. The storage lockers are really well laid out. There is a dedicated spot for the life raft, space for two large gas bottles (none of the others had this) the head has a great little shower door so the whole area doesn’t get wet if you have a shower. There is a deck shower too. There is good storage, they have Yanmar engines (which we prefer over Volvo). There is a huge anchor locker, you can get a double bow roller, and the interior set up is the way we want it. So if you are heading on a boat show shopping mission like us – here are my top tips! Compare apples with apples – what are the things that you really want on a boat? Make notes after each boat – they all blend in to one after a while! Use the sales consultants – extract as much information from them about the boats as possible. Remember that the base price is just the start – there are lots of different options and add-ons. Figure out what comes as standard and what you need to add on. Right had better get back to work, we have got a boat to save up for! Always exciting to check out possibilities for your next yacht! so my question is – how many did you buy? Hey Viki and Andrew – thanks for the shout-out for sailingmareda ! We’re now more than 2 months into full-time living aboard and love this boat. Here in France, no one buys a new boat anymore – everyone is leasing with option to buy. If you buy, you pay 20% tax. If you lease-to-buy, you only pay 10% and have a nice monthly payment plan set up. If you maximize your 1st down payment and monthly payments, you can end up getting the boat cheaper than the initial asking price. We’re may be eating beans and rice for the next 4 years but we’re saving a bundle ! Oh that sounds interesting! Will check that out. Oh, Viki! How exciting! And fun! I see a boat show in my future simply to look and have fun! Fair winds and following seas while you find your next great yacht.